Carmen Tarantini is a fortunate man. When the fit, healthy 68-year-old began feeling fatigue without cause, he went to see his family doctor, who sent him for tests and referred him to his own thoracic surgeon. A month later, after multiple low dose chest CT scans and biopsies, William Osler Health System thoracic surgeon Dr. Kashif Irshad delivered the diagnosis to Tarantini and his wife, Anna. Tarantini had early-stage lung cancer. Three weeks later, Irshad surgically removed the lower half of Tarantini’s right lung. A biopsy confirmed the cancer was Stage 1B with no lymph node involvement and no need for chemotherapy. “Quite honestly, they were a helluva good doctor team working together, doing everything from A to Z. Congratulations to Dr. Irshad. 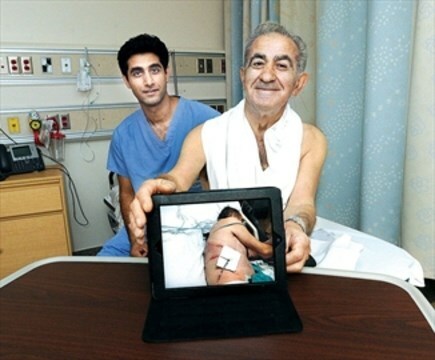 He prepared everything ahead of my surgery,” Tarantini recounted Friday, Aug. 10 in a meeting room at Brampton Civic Hospital, where he had his life-saving surgery on June 6. In Canada, lung cancer continues to be the No. 1 cause of cancer death in both men and women, reports Cancer Care Ontario (CCO), the provincial agency responsible for continually improving cancer services. In fact, the incidence of lung cancer deaths in Canada is greater than deaths from breast cancer, colorectal cancer and prostate cancer combined, CCO reports. Tarantini is the first patient to undergo early stage lung cancer surgery through William Osler’s new Early Detection of Lung Cancer Program launched in February. Osler is designated as a regional level 1 centre for lung cancer by CCO. Irshad conceived the program to proactively detect lung cancer in its early stages and to treat it before it becomes symptomatic, a new approach that can help greatly increase a patient’s chance of survival, he said. At present, Irshad sees on average 10 lung cancer patients a week in his practice. In eight of them, the lung cancer is advanced beyond the stage of a surgical cure, he reported. In Canada, the vast majority of lung cancers are diagnosed at an advanced stage, due in part to the lack of effective early detection procedures, Irshad said. When late-stage lung cancer is diagnosed, often after the onset of symptoms such as chronic cough, coughing up blood, a hoarse voice or sudden weight loss, surgery is rarely an option. Patients are instead provided palliative chemotherapy and radiation therapy. Irshad initiated the program, co-founded with Dr. Marc Ossip, Osler’s site chief of radiology at Etobicoke General Hospital, following a landmark U.S. study of low radiation dose CT scan screening involving more than 53,000 patients at high risk of developing lung cancer. The National Lung Screening Trial, published in The New England Journal of Medicine a year ago, demonstrated a 20 per cent reduction in deaths among high-risk patients screened with low radiation-dose CT scans when compared to routine chest X-rays. Osler’s new Early Detection of Lung Cancer Program is led by a team of Osler’s thoracic surgeons, with support from a range of multidisciplinary specialists, including radiologists, respirologists, pathologists, oncologists and a clinical nurse navigator, who processes patients through CT scan and biopsy bookings and documents and communicates the details to the patient’s primary care physician. Eligible patients receive a low dose CT scan, one-tenth the radiation of a full dose chest CT.
Any concerning abnormality identified in the early detection CT scan will trigger an immediate referral to the Solitary Indeterminate Pulmonary Nodule or SPIN Clinic, which will assess a patient within two weeks to reduce patient anxiety. Irshad believes Osler’s SPIN clinic to be the first of its kind in Canada. Since most lung nodules seen on CT scans are benign, the SPIN clinic ensures patients with benign disease are watched carefully, and those with malignancies are treated appropriately, Irshad said. People aged 54 to 75, who have a 30 pack-year history of smoking and no previous history of cancer, are eligible to be enrolled in the program. Thirty pack-years refers to the number of packs of cigarettes a person smokes per day multiplied by the number of years they have smoked. Someone who smoked two packs a day for 15 years or one pack a day for 30 years would be a 30 pack-year smoker. Tarantini had smoked for 50 years until his doctor’s visit April 14. He has since quit smoking. Patients screened in the program will remain enrolled until age 75. If no abnormality is detected, a patient will undergo a CT scan every two years. If an abnormality is detected, the team will recommend follow-up scans every three or six months, or annually, depending on the case. The thoracic surgeon has sent an information kit to family physicians in Osler’s catchment areas of Etobicoke, Brampton and Georgetown to inform them of the program. The kit includes a requisition form a doctor may use to enable their eligible high-risk patient to receive a low dose CT scan in the early detection of lung cancer examination. “You have to get a diagnosis right away. You don’t know if it’s too late,” Tarantini urged people who could be suitable candidates for the new program. While Irshad said Tarantini’s fatigue is unrelated to his lung cancer, had the cancer not been detected early, Irshad estimates within one year or less Tarantini would have developed late-stage lung cancer, which would have been inoperable. The new program will screen 700 high-risk patients a year. Irshad expects lung cancer to be detected and diagnosed in two high-risk patients per 100 CT scans. Osler’s new Early Detection of Lung Cancer Screening Program came too late for Irshad’s father-in-law. Mushtaq Qureshi died a year ago, nine months after symptoms of a chronic cough, blood-tinged sputum and a 40-pound weight loss led to a chest X-ray that showed lung cancer that had metastasized to his lymph nodes and bones. “That was one of the reasons why I wanted to pursue this. He would have been a candidate for the screening program. We could have caught that (had the program been running a couple of years ago),” said Irshad, who had considered naming the new program after his late father-in-law. Program co-founder Ossip said the SPIN clinic is revolutionary in its early detection of lung cancer. Previously, there was no set protocol to assess, diagnose and monitor patients at high risk of developing the often-fatal disease, Ossip said. Two months ago, the American Association of Thoracic Surgeons issued a recommendation in favour of early detection lung cancer screening with CT scans. Ossip called the early detection lung cancer screening trial published in The New England Journal of Medicine “very conservative” and suggested benefits of Osler’s screening program could be even greater than those demonstrated in the trial.